Evolution Gaming, leading developers of live casino software, have announced two new live casino areas for Genting Casino. With 50 years of experience in the casino industry, leading the way in both online and real-casino play, Genting has brought its heritage and wisdom together to create the ultimate live casino experience. Genting’s new and innovative Real Casino, available through their website or downloadable platform, includes a vast range of brand-new HD live casino games. This comprises of Live Baccarat, Live Blackjack, Live Three Card Poker (aka Brag) and an impressive range of Live Roulette games. The Crockfords Room features some of the highest table limits a live casino has ever offered..
Also announced is their dedicated Crockfords Live Casino experience - Genting’s most established and oldest private VIP club. The Crockfords Room features some of the highest table limits a live casino has ever offered — certainly catering to established high rollers and celebrity VIPs. It takes live gaming to a whole new level of luxury with rich mahogany tables and industry-leading live dealers. The overall impression you get from the Crockfords Room is that of a upmarket London casino. The idea is for players to experience luxury through their screens, and it appears that Genting has successfully pulled off this difficult task. Players are able to access all live casino rooms via their PCs, laptops, mobile phones and tablets. This allows gamers to play on the go, whenever and wherever they are. The two rooms will be in addition to Genting’s already popular live casino offering. Click to Play Now at Genting Casino Get 100% Bonus up to £1,000 + 200 Points! New players only. Casino games only, 50x wagering requirements on bonus before withdrawal of bonus funds permitted. Max bonus bet £10, multiple positions/numbers allowed. Deposit funds can be withdrawn at any time. Bonus expires after 30 days. T&Cs apply. Genting Casino, being a world leader in both real and online casino gaming, are looking to redefine the live casino experience. All live casino games will take place on exclusive Genting Casino tables, with only Genting players permitted access. All tables will be branded with the Genting name, ensuring their players get the high-quality experience they have come to expect with the wide range of other casino products the casino has to offer. 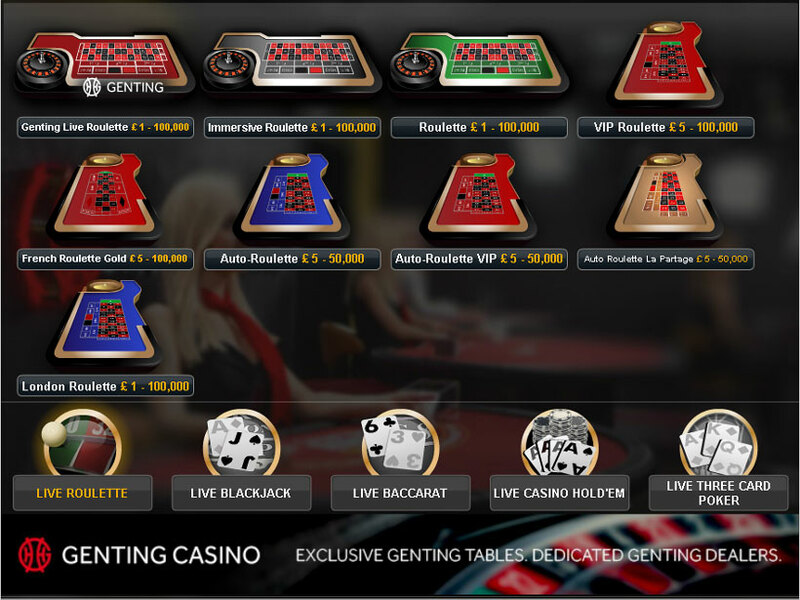 While other gaming providers share their live casino platforms, Genting’s live casino tables are available only to their players. This ensures a smooth and reliable live casino service, with Genting overseeing all operations. They are also set to offer a market-leading live casino rewards programme for all players new and old. All points you accumulate playing their live casino games can be converted into cash, allowing you to spend it back at the casino or withdraw into your bank account. Right now, Genting are inviting players to try their new live casino with a £10 bonus completely free - find out more by clicking through to their website. All of Genting’s live casino rooms will be broadcast 24/7 in crystal clear high definition. This is ideal for those with high-end devices, allowing players to take advantage of their HD capabilities. Customers with lower-end devices need not fear though, as Genting’s live casino will show up beautifully on all devices. Variety is the spice of life and Genting are offering 19 different live roulette camera angles. This allows you to experience the full scope of the roulette table, creating big-picture realism that you would expect from a real casino. All other live table games are beautifully rendered and utilise sharp, simple camera angles. Communicating with the dealers is simple, with a live chat service included in every room. This is a service that few live casino operators offer and is a welcome addition to the immersive real-time casino service customers are looking for. Genting are catering for all budgets with a wide range of table limits from as low as 20p. This allows regular casual casino gamers the opportunity to experience their amazing range of brand new HD games. Whether you enjoy playing for a couple of hours in the evening, or Sunday afternoon, Genting allows you to play live casino without breaking the bank. Genting offers a practice option for beginners who are not quite experienced enough to place real money down. This permits beginners to get a feel for their live casino offering before risking any money — a great way to practice for when players eventually head off to a real casino. For those who are more inclined to play high-stakes card games, then Genting have their very own ‘Super High-Limits’ Live Blackjack room. Here you’ll be able to spread your wings and play at some of the most exhilarating table limits live casino can offer. There’s also high-stakes Baccarat and Three Card Poker available. Whether you’re a high-roller looking for the best gambling opportunities, or a casual gamer who is looking for a stable, secure HD gaming experience, Genting’s brand new live casino offers everything and more. Head on over to Genting, or check out our other live dealer casinos to find your ideal gaming provider.